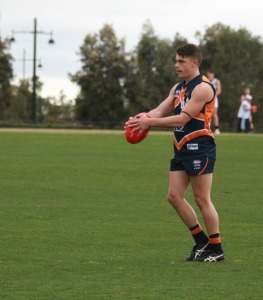 CALDER Cannons midfielder James Peters has credited the support of his teammates with getting him through an injury-plagued past two years. The Aberfeldie junior has spent more time in rehabilitation than on field since a serious ankle injury ruled him out for most of the 2015 season. Peters returned in Round 2 this year, but was then sidelined because of a broken jaw and has missed recent matches due to a shoulder problem. Over the past three seasons, he has been limited to 12 TAC Cup games. “It’s been pretty up and down,” Peters said. “First, coming back with the ankle, I thought I was pretty well prepared. “I started playing some half-decent footy and then unfortunately hurt my jaw. That wasn’t too good. Peters, who attends the Elite Athlete Performance Network with Cannons teammates Karl Brown and Ben Ronke, said the close bond he had formed with his teammates had helped him through rehabilitation. “It’s very important,” he said. “There’s just some days where you don’t want to show up. Those boys make it so much easier to come to training and make you do your rehab. Earlier this week, Peters held out hope of returning from his shoulder injury in Saturday’s TAC Cup elimination final against Oakleigh Chargers. The on-baller said he was confident the Cannons were capable of challenging for their seventh premiership from outside the top four. “I think we’ve jelled together pretty well as a group the past couple of weeks as the results have showed,” he said.